But Rob and I made a conscious effort to – okay, let’s say that I made a conscious effort to take in a good portion of the other trails. A few we completed entirely, a few others I’d have to finish off at a later date. And as this trip report’s title implies, there were some really great surprises on these trails; they were not only much better than I expected, but also much better than the snobby Mainline Trail as well. Yup. It’s blazed blue just like the Mainline trail. And just like the next trail too. And the one after that. Why? Why confound the casual and serious hiker alike? I don’t have any idea but I do know it’s really pretty annoying. [This has since been remedied and is now the blazes are blue and red.] 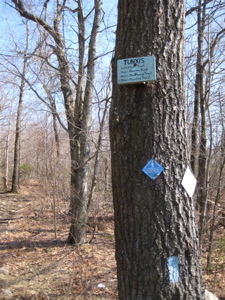 Keep in mind that all 18 Tunxis Trails are called “The Tunxis Trail” despite their other names. So if you’re out for a day hike in this area, be careful. There are usually little blue wooden signs high up in trees that attempt to explain your whereabouts – but most are too weather-worn to actually read. In other words, bring a map. The Stonehouse Trail is lame. Sorry, but it is. It’s short and it’s flat. 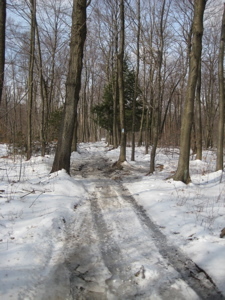 It’s also quite unmemorable as well; after veering off the Mainline trail at the southwestern edge of the New Britain Reservoir (the 3rd so-named New Britain Reservoir I’ve passed on trails thus far) the trail is pretty much just an eroded ATV connector route. 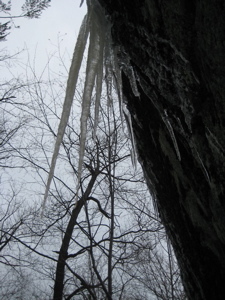 For us, the ice and mud made it somewhat “interesting,” but not in a way that will bring us back to it. Rob and I talked constantly over the quick little trail and therefore missed the attractions along the way. According to the CFPA Walk Book they are: “A stone foundation of a small house on the left, another small foundation on the left, and a third foundation and a dry well.” So when you are out there, in the wilds of Wolcott avoiding ATV’s and questioning your very self-worth, be sure to note these three small stone foundations. To be fair to us, they were very most likely buried under the snow and ice. 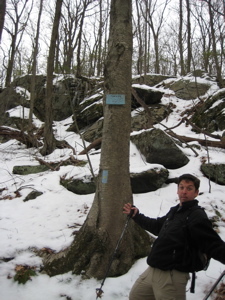 After finishing up the Stonehouse along what was “Old King’s Highway” back in colonial days, we hit the Woodtick Trail and reveled in the fact that we were done with the Stonehouse. But not without one more random fact: Early roads were mandated by Colonial Law and known as King’s roads. Old King’s Highway dates back to 1753. So that’s kind of cool, I guess. The best thing about this trail is obviously the name. “Woodtick” is a very prevalent name in Wolcott for some reason – a reason I never really thought about until now. Yes, the Woodtick is as ugly and uneventful as the Stonehouse but not only does it have a very interesting old cemetery along the way, it also affords me an opportunity to explore the name “Woodtick.” Awesome! Oddly enough, it took me two separate hikes to complete this short little trail. The first .7 mile part was done with Rob as part of a loop back to the Mainline Tunxis and the second I did later as an out and back off of – you guessed it – Woodtick Road. 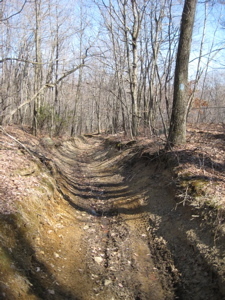 As noted, the trail itself is – again – a junky ATV scarred tract for the most part, but which ends with a respite from the erosion with a steep little downhill section to connect back with the Mainline Tunxis at the north end of the New Britain Reservoir. 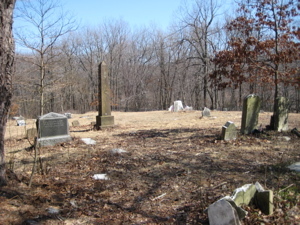 About a third of a mile off of Woodtick Road, the trail skirts an old cemetery, called the Northeast Burying Grounds. I’m not into cemeteries at all, though walking through the weathered gravestones here was pretty cool. Though in disrepair, someone is still trying to keep it up a bit which was nice to see. There are maybe 50 headstones here but a few stand out in particular. It turns out that Louisa May Alcott’s forebears are interred here. 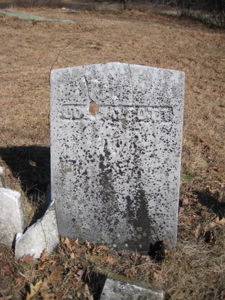 I poked around and found some stones with “Alcott” etched into it. Not that I’ve ever read anything written by Alcott, nor do I ever plan to, but hey… Who knew? 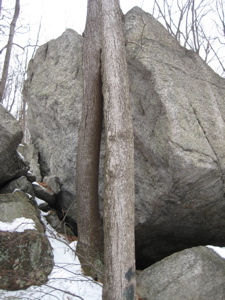 One of the groups that inhabited western Connecticut was called the Mattabesic. According to Mattabesic History by Lee Sultzman, in 1600, the Mattabesic probably numbered 6,000 and had as many as 60 villages. … The Mattabesic weren’t really a tribe in the usual sense, but a group of small scahemships (groups led by a chief) who were normally made up of two or three villages. The Tunxis had two other villages: Tunxis (near Farmington) and Peguabuck. The Tunxis may have had 500 members. 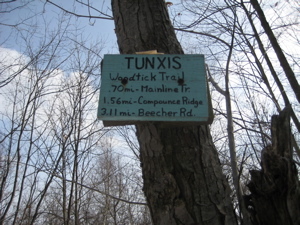 If the Tunxis people were divided evenly between the three villages, Woodtick (in Wolcott) might have had 175 or so residents. Villages were built on flat ground near a water supply. Where was the village of Woodtick located? The exact location is not known, but it may have been in the Woodtick Road area. This area is flat and has a good water supply (the Mad River). Maybe it’s good enough just knowing that they lived, had families, and hunted here. Something to think about when hiking this little trail I guess. First question: Yes, there are bobcats in Connecticut. Second question: No, there is very most likely not a resident mountain lion population. That didn’t really make a whole lot of sense, but I can glean that the Bobcat exists for historical reasons – and remains because it’s a pretty cool little trail. 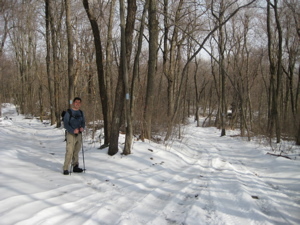 Rob and I could see through the winter woods that we’d be headed through the swale between two knolls to hook up with a few other trails that would take us to some nice outlooks. We saw an old computer someone dumped up there. Annnnnnnnnnd not much else. The Bobcat does turn off right before “The Gateway” which is just a big rock where a few of the trails diverge from. So that’s something. On my second trip to these trails, after coming down from the north, I circled back to head north on the latter half of the Bobcat to connect back to the Compounce Ridge Trail. This northern half of the Bobcat merely trots down an old forest road with some random jogs off of the road to get away from the boredom I guess. Again – listen to me! The Bobcat Trail still exists, but it’s different now. Now being 2015. I’ve always been one to appreciate to-the-point trail names. “Hey, Rob… Want to hike the Steep Climb Trail?” “Sure – what do you think it’s like?” “Not sure, but I’d guess it involves a steep climb.” Or descent, in our case. Our car spot was at the bottom of this trail at the end of Panthorn Trail – a residential road in Southington just a smidge south of the Bristol town line. When we parked before driving off to begin our day of Tunxis trekking, we stared up at the wall in front of us and said, “We’ll be coming down that in a few hours. We’re going to slip and fall. 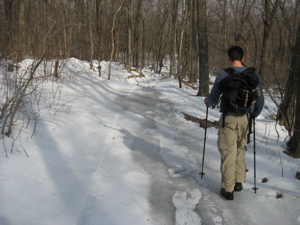 A lot.” With all the snow and ice still present, we were both a little trepidatious – but laughed off the thought of bruised buttocks because we’re, well, we’re tough like that. 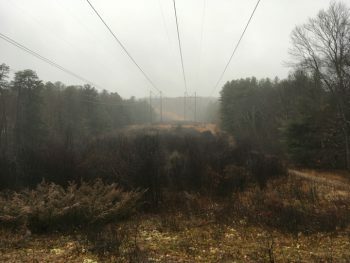 After completing the Southington section of the Tunxis Mainline, the Bobcat, and the Stonehouse/Woodtick loop, as well as a piece of another regional trail (the Compounce Ridge Trail), Rob and I stared down the steep hillside and basically said, “Oh well. It’s only half a mile, right?” Right. 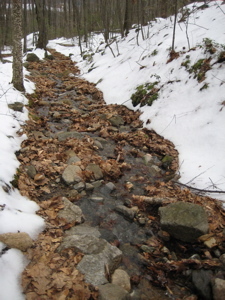 The first section of the trail was essentially a mountain streambed – which I’ll admit, really wasn’t all that fun. We then took off down the slope and before we knew it, we were almost forced to sort of run down the slope. Guess what? It’s steep. Very steep. Throw in the aforementioned slippery conditions and it was that much more fun! Actually yes, it was fun. We used downhill skiing techniques, sort of zig-zagging a bit and grabbing trees every now and again for support. The trail contours the hill to a large degree, which obviously made the descent doable. As we approached the bottom, the Lake Compounce water park was not too far away which added a little bit of surrealism. For the record, Rob never fell on the descent and I only fell once – in a very controlled, painless way. We emerged from the woods and immediately began planning for the next stretch of the Tunxis (several miles away, up in Burlington) and hit the road. Now you’re left wondering – what the heck were the “Nice surprises” I referenced in the title? Good question – especially since my reviews of the four trails above were not exactly glowing. 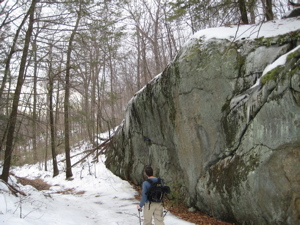 Turns out, the best part of our hike, by FAR, was actually a piece of the Compounce Ridge Trail that extends further north into Bristol which I completed later. This included two really, really cool overlooks, but you can read about them in my Southington Section North report.